Ada County, located in the southwestern part of Idaho, is the most populous County in the state as well as center of commerce and many industries. Unincorporated areas in Ada County, outside of its six (6) incorporated cities, are governed by the Ada County Zoning Ordinance or Titles 8 and 9 of the Ada County Code. Ada County Zoning Ordinance provides land use guidance for the unincorporated territory of Ada County through five (5) base districts and eleven (11) overlay districts as well as zoning map that spatially codify the aforementioned base and overlay district boundaries. In this project, Development Services proposes to amend specific standards, requirements and processes for making land use and development decisions within the zoning ordinance. It is not proposing to make any changes to the companion zoning map. Ada County adopted its first zoning ordinance on May 20, 1968, as Ordinance 33. Over the years, this ordinance was amended multiple times with the last major revision adopted on June 19, 2000, as Ordinance 389. Though there have been minor amendments to the zoning ordinance since 2000, the existing zoning ordinance is showing signs of age and in need of a comprehensive revision. 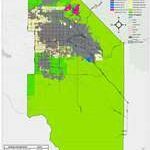 Six (6) city adopted the comprehensive plan’s goals and policies. County, city and agency staff collaboration. Phase 1: Define Scope of Work. Phase 2: Development of Draft Documents. Phase 3: Stakeholders Review and Comments. Phase 4: Adoption Documents and Hearings.